Overland Park is the second most populated city the great state of Kansas and for many of us it is the place we lovingly call home. Due in part to its low crime rate, high opportunity for employment, and relatively reasonable cost of living, Overland Park attracts people from all walks of life; particularly those looking for a place to raise children. That is why the need for dentistry for kids is an area of expertise that is exploding in our area. Because of the economic stability, kids growing up in Overland Park have been able to receive quality educational and medical services. A great example of this can be accurately illustrated within the Overland Park dental community, as both kids and adults are able to receive what’s considered to be, some of the highest quality dental care nationwide. Studies have shown that children at a young age are often able to learn and absorb new information with amazing quickness; therefore it is important for proper oral hygiene to be taught during this time in order to prevent potential dental problems before they occur. Like an adult, the beginning of decay can lead to a lot of problems for a child, some relating to oral health and some relating to overall well-being. This emphasis on prevention is a theme that you will find echoed throughout the Overland Park dental community when talking about dentistry for kids, particularly among its most sought after dentists. Some dentists consider providing education on prevention (to both adults and children) to be as much a part of their job as providing the actual dental care itself. Several of the local Overland Park school districts provide assistance to make sure students receive the care they need by requiring them to have a regular dentist when they are enrolled. 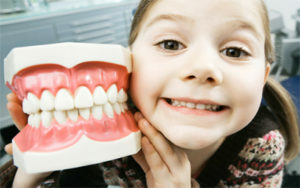 Many school districts provide education about dentistry for kids for students and their parents. During the month of February, also known as Children’s Dental Health month, many schools also provide activities and additional information about dental care. While there are many significant benefits in living and raising a family in the safe, clean, and productive city of Overland Park, don’t forget that our dental community is here to provide you with fantastic dentistry for kids that will keep them smiling for years to come. Offering dentistry for kids is important to us, because we love our patients and we want them to be healthy. If you’d like to schedule an appointment, contact us at our south Overland Park office at (913) 647-8700 or our north Overland Park office at (913) 341-2380. We look forward to having the opportunity to be your Overland Park family dentist.